One of the biggest challenges in today’s law firms is recruiting partners, experienced associates, and senior business professionals into the firm—and then finding ways to integrate them, retain them, and help make them sustainably productive. Yet, many firms are misallocating their efforts and resources. 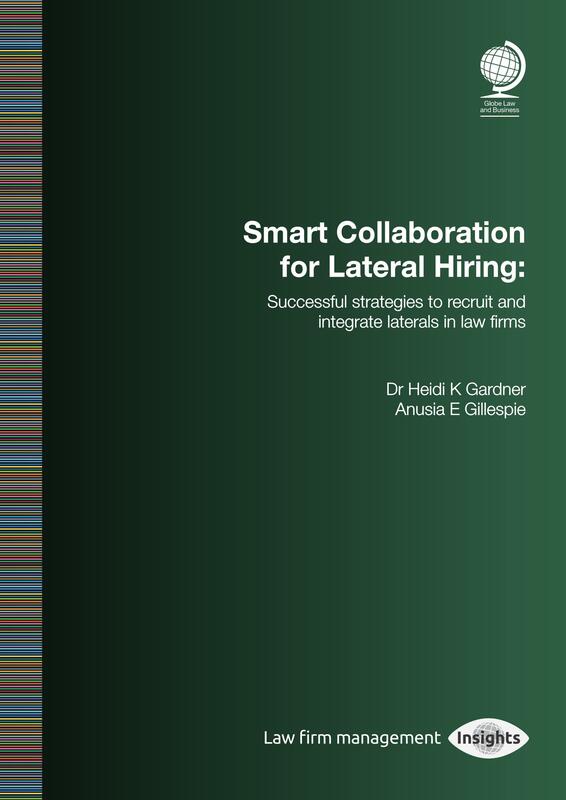 This Special Report offers a new, research-based approach for law firms to improve their lateral hiring process and results by engaging new hires in smart collaboration. Laterals who collaborate with their new colleagues are significantly more likely to stay with the firm longer, to hit or exceed their targets, and to thrive professionally. Firms need a well-constructed plan, a relentless focus on execution, and clear accountability processes if they expect to help laterals achieve two-way collaboration quickly and efficiently. This Special Report offers the tools, processes, and best practices for successful implementation. Aimed at readers who aspire to take a more strategic approach to improve lateral hiring, this report will be useful for law firm leaders, hiring partners, professional executives such as chief operating officers and chief talent officers. Lawyers or business executives considering a career move across firms, or business professionals seeking to move into the legal sector, will find practical ways to boost their likelihood of success.